Erleben Sie die Umgebung von Antigua mit dem Motorrad, Roller oder ATV. Diese 5,5-stündige Tour führt Sie in 7 Dörfer am Stadtrand von Antigua, einschließlich Ciudad Vieja, der ersten Hauptstadt Guatemalas. Sie besuchen einen Textilmarkt und ein indigenes Dorf am Fuße des Agua Vulkans. Genießen Sie eine kurze Wanderung, Hängematten und Panoramablick von einem Aussichtspunkt über Antigua. THIS WAS A GREAT TOUR!!! Our tour guy Minor was absolutely professional, knowledgeable about the area and ensure we all had a great time while ensuring we were safe throughout the trip. 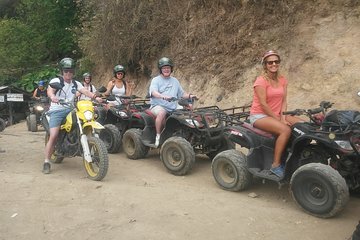 There is no better way to experience Antigua and the villages than on an ATV. Can't wait to go back and take another tour with this team. Thank you again!!! Enjoyed the experience but two people on one quad of that size was uncomfortable for both driver and passenger. Was a shame that the lunch stop was closed but the alternative was fine. You took a number of photos and asked for our e mail- do we have any access to them as part of your service because to date we have not received any. Freddy collected me from my hostel at the designated time and the entire first portion of my trip turned out to be one-on-one. We stopped by the village of San Antonio where Freddy pointed out buildings, the market, the garments, and explained some history. We also stopped by Ciudad Vieja and Santa Maria de Jesus. Freddy pointed out so many things from the washing centers that women use to the layout of every square in Guatemala school, park, council building, church. He was also very aware of traffic and made sure it was safe to make left turns for both of us before proceeding. His near perfect English made my experience all the better since I was able to ask questions and communicate with him easily. For the second half of my tour, we met up with another group led by Joaquin. We drove to Earth Lodge which required a hike down and back up on foot. For this reason I recommend at least sandals with a back if not sneakers/hiking boots, definitely no flip flops! The group consisted of some older folks and Joaquin was very good at balancing the pace of the group Im in my early 30s and the rest were 60. He walked ahead with me and we got extra time to relax while the others were able to go at their own pace. The lodge has hammocks, picnic tables, food, drinks, WIFI, outlets, and a fantastic view! There is a short 10 min trail that you can take and will loop you back to the restaurant area. There is also a playground for kids. After Earth Lodge we went to the Cerro de la Cruz which offers an overlook of Antigua. After that it was back to Antigua where you drive to your hostel and they have another staff member there to drive your vehicle away. I chose an ATV because it felt most stable and I knew Id be able to take pics/video easily while driving. I almost wish I had chosen a motorcycle now because I dont know where else Im going to be able to do that without getting a license! I felt the tour itself was fantastic and highly recommend it especially if you have a few days in Antigua. It gives you a chance to get outside of the city. Our guides were Joaquin and Erickson. They knew their stuff when it comes to ATV's and motorcycles, but they weren't well informed guides. They just took us to three villages, but didn't give any explanations or data. Jessica, my granddaughter, drove an ATV, but I chose to ride along. Jess's bike had two bald back tires - not helpful when going downhill on sand...We enjoyed our day it was an unforgettable experience. This tour was truly the highlight of our cruise - even better than going through the Panama Canal which, admittedly, is pretty hard to beat! 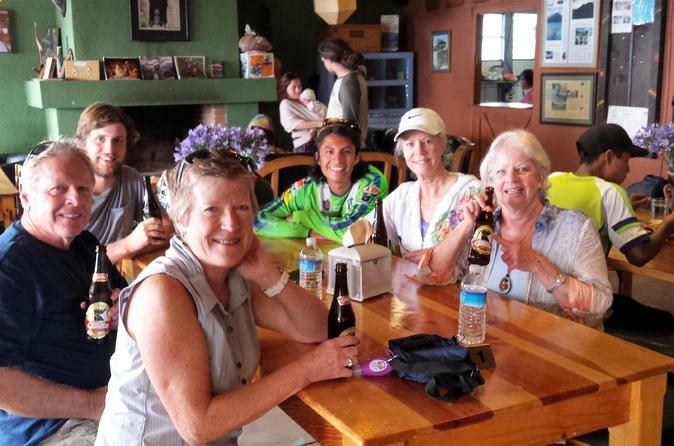 If you want a thoroughly authentic Guatemalan experience, you must take this tour. Not only is it a wonderful value, we saw things you just can't see if you're on a shore excursion or exploring on your own. Because they keep the groups small there were four of us, plus one other person, and our tour guide, it is an intimate experience with a lot of personal attention. Our tour guide, Freddy, was the best! Riding the quads is a great way to get up close and personal with the local people and culture, not to mention just being a really fun way to get around. As we rode through the streets, people would stop and wave and greet us. Freddy took us through various villages around Antigua, stopping at a church and shopping bazaar for a quick bit of shopping for REAL Guatemalan handmade goods. We then rode up into the mountains to Santa Maria de Jesus, the last indigenous Mayan village in Guatemala and that was an incredible experience! It was Sunday so the market was going on, as well as a wedding ceremony in the cathedral. All the women dress in their native garb, a real sight to behold. We were the only tourists there. We've never experienced anything quite like it. We then rode to the Earth Lodge, a kind of hippy enclave in the mountains where you can stay in cabins and tree houses and participate in yoga classes and other soul-enriching activities. But we weren't there for that - that day, they had a band and beer tasting. Despite the remote location and the fairly long walk to reach the lodge, there were quite a few people there and we were able to grab a beer and a bite to eat. The whole tour took about 6 hours, with every minute being a blast! If you have the chance, take this tour. You won't regret it and you'll be able to see Guatemala up close and personal.